"Delightful Production for the Whole Family"
Sight and Sound Theatres in Branson, Missouri has filmed a staging of the Bible story NOAH, the tale of a faithful man of God who builds an ark to allow him and his family to survive a great flood. This stage production is funny, full of amazing spectacle and genuinely engaging. A strongly Christian worldview and careful writing make NOAH appropriate and fun for the whole family. Sight and Sound Theatres in Branson, Mo. is well known for their spectacular productions of biblical stories. Their website proclaims their passion for “bringing the Bible to life.” Big special effects and grand imaginings are their bread and butter, and they do it better than nearly anyone else. In a new filming of their production of NOAH, Sight and Sound proves once again that their imagination and production capabilities are enormous. This musical follows the familiar biblical tale of Noah and his family. They are a righteous bunch, living amidst a sinful community. God tells Noah that the world is about to be flooded, the sinful creation wiped away, but God also provides Noah family with instructions to build an ark – a HUGE boat – and fill it with a pair of every known animal. Thus, Noah, his family, and the animals can all ride out the flood safely and begin a new world when the waters recede. Sight and Sound tells this story with incredible production elements – like live animals (of course), special effects (fire, rain), projections, and an absolutely enormous ark. These elements sweep the audience away into Noah’s world. This telling is also filled with big musical numbers where Noah and his family sing about God’s faithfulness, about the daily lives of building the ark, and about the fear in their hearts that God has abandoned them. Some of the music ventures into hokeyness, such as the song about the women weaving baskets, which seems unworthy of the rest of the production. Moviegoers attending the Fathom Events showings of NOAH would do well to remember they’re watching a musical play. Because the cameras are able to get much closer to the stage than an audience member at the actual performance typically would, movie audiences are shown things we might not be intended to see. Costumes and special effects that are undoubtedly marvelous in the space seem fake and cheap up close in the cameras (especially the beards). Performances by the actors that are designed for an enormous room and hundreds of live people suddenly seem a little over the top and without subtlety. Even so, if the movie audiences can let themselves fall into the imaginative world where they are seeing a play rather than a movie, NOAH becomes an incredibly enjoyable experience. The script is heartfelt and contains some clever, unexpected humor throughout (like when Noah worries that the location he’s chosen for the ark is on top of his wife’s vegetable garden). There are some cheesy moments, but they are far outweighed by the earnest, stirring moments that become standard fare through the play’s two hour run time. Sight and Sound built a full imagining of Noah’s world, including of the sinful people that occupy it. The other inhabitants (besides Noah’s family) vary from complex, misguided, REAL people to exaggerated, cartoonish villains. In this way, the play is slightly inconsistent. This is, of course, par for the course at Sight and Sound. NOAH is a delightful production for the whole family. There is very little questionable content, outside of some mild stage violence. A robust Christian and biblical worldview flows through the whole piece. Church classes, small groups and youth groups may consider viewing NOAH and exploring its portrayal of the family’s faithfulness and God’s judgement. Sight and Sound Theatres in Branson, Missouri has filmed a new staging of the Bible story NOAH. Their spectacle-driven production tells the story of Noah and his family who receive a message from God to build an ark, which will protect them from a coming flood. However, as they build the ark, Noah’s family receives harsh rebuke from their community, including their friends and relatives. In the face of an impossible task, will Noah and his family rise to the challenge God has laid before them? 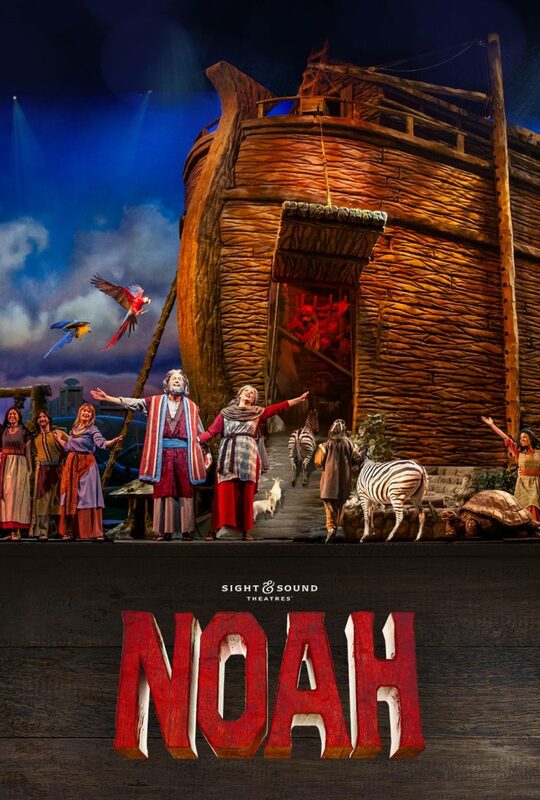 Those who know Sight and Sound Theatres will find NOAH to be a charming production. Big spectacle exists throughout – special effects, animals, large projections, and an incredible physical ark! Audiences should remember that this is a filming of a stage production played in front of a large audience, so the actors’ performances are designed for a large room, not for the subtly of a camera. The script is funny, and the production team has done incredible work. A strong Christian worldview, the inspiring faithfulness of the characters and family-friendly humor make NOAH appropriate and fun for everyone.